This tactical self defense pen has some new features designed into it. 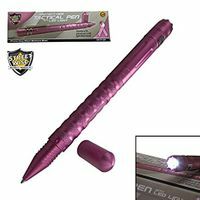 Besides the sturdy and lightweight body that allows you to use as a kubaton, this pen has a DNA catcher end and an led flashlight to further enhance its utility as a tool and weapon you want to carry with you. 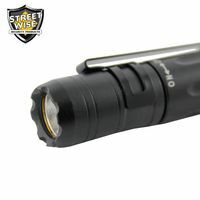 The super bright led flashlight is powered by one AAA battery (included) and puts out 80 lumens (for real), which is very bright and worth the price by itself.The light also has a self defense component in being bright enough to temporarily blind an attacker if shone in his eyes from close range. The cap is a tapered rounded striking surface to concentrate your force where you want it without cutting flesh. If you want a blade, carry a knife. 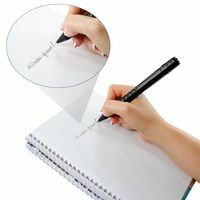 The ink pen uses standard refills and is protected by a removable pressure point cap which can be used for self-defense. 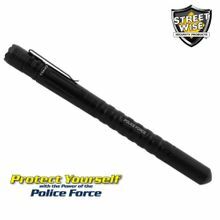 Lifetime Warranty: The Police Force Tactical Pen is made of the highest quality components and comes with a lifetime warranty. So there you have it, this item is almost 7 inches long and about the diameter of a sharpie. You can strike, poke or jab with impunity as it will not break and can multiply and concentrate the force you generate to create an opening for escape.